The Scottish DNA Project currently has over 5800 participants who have tested with Family Tree DNA. How to join: If you have never had your DNA tested there is a discounted price available by joining through the project. - Login to your FTDNA account. - At the top of the page you will see the 'Projects' tab. Go to 'Manage Projects'. - Scroll to the bottom of the page and click on the 'Join' tab. This will be processed by the project administrator and you will receive an acknowledgement that the process is complete. Alternatively if you have not tested before and live in the British Isles test kits can now be purchased and mailed direct from United Kingdom in £Sterling. If you tested with another company you may now transfer your Y-DNA results if they used the Sorenson 33 or 46-marker test. This includes results from Ancestry.com, GeneTree, and Sorenson's SMGF. If you are interested in 'deep ancestry' whether it is male or female origins, we would presently recommend the National Genographic Project Geno 2 kit. The test costs approximately £124 ($199.95). The Geno 2 kit tests 12,316 Y-Chromosome SNPs and 3,352 mtDNA SNPs mitochondrial SNPs. Test results from the National Genographic Project can be transferred into the Family Tree DNA database (and attached to your kit number if you have already tested with FTDNA). This company only test markers called SNPs for 'deep ancestral' origin. 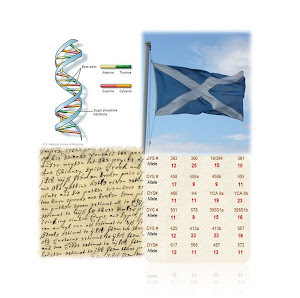 If you are a male and have tested with ScotlandsDNA we would recommend that you take the 37 marker Y-DNA test with Family Tree DNA which will enable you to participate in the Scottish DNA Project. The results from this test will potentially give you matches within a genealogical time frame. Unfortunately we cannot at present include these within the project results. Test kits can now be ordered in £Sterling (includes the small project discount) and mailed direct from the United Kingdom. Pay by £cheque, PayPal or credit card. Email alasdair@familytreedna.com for more information.